The Mountaineers fundraiser on March 18 is sure to be a night to remember. We'll still have a few surprises up our sleeves, but here's a sneak peek into some of our exciting auction items for the evening. Awe is defined as "an overwhelming feeling of reverence, admiration, and fear produced by that which is grand, sublime, and extremely powerful." At The Mountaineers, we have 110 years of awe-inspiring moments in our history, from our founding in 1906 to helping to establish all three national parks in our state, we are proud of our legacy and are doing all we can to continue making an impact. As we look toward our second century of exploration, The Mountaineers is seeking to once again change the face of the outdoors. To help us achieve that mission, we're hosting a night to remember called AWE, where we'll explore and celebrate our collective achievements. By attending and bidding in our auction, you are directly supporting the next generation of outdoor lovers. We hope you'll join us. Beautiful Whistler Townhouse for Four: Get away to Whistler for a full week in a one-bedroom townhouse with three of your friends! This home sleeps as many as four guests, has a cozy gas fireplace, fully equipped kitchen, free underground parking and best of all, is one block from paved bike trails and located directly across from the Whistler Village and Marketplace Plaza! Seattle Scenic Flight for Two with Kenmore Air: Enjoy a Scenic Seattle Flight Tour with Kenmore Air! Everyone gets a window seat on this narrated 20-minute flight over the Seattle metropolitan area. And of course, the flight begins and ends with an exciting water takeoff and gentle landing on Lake Union right in the heart of the city. Therm-a-rest Sleeping Bag and Mattress: This is the feature-packed adventure sleeping combo you’ve always wanted with the Therm-a-Rest Questar sleeping bag and Neoair Trekker mattress, perfect for camping, backpacking, and the great outdoors. Compact and light, advanced materials assure the lightest and most compact gear possible. Seven Night Cruise to Costa Rica and Panama on Un-Cruise Adventures: An inclusive 7-night adventure cruise aboard aboard the 64-guest Safari Voyager. Explore Panamá's vast Darién Jungle, snorkel Guna Yala’s (formerly San Blas) Eden-like islands, discover Native customs, and watch for humpback whales; or hike Costa Rican jungle as macaws, sloths, and monkeys keep watch, kayak and skiff secluded mangrove forests. Stay with Steve Swenson, accomplished alpinist and winner of the Piolet d’or in 2012, at his winter home in Canmore, Alberta, approximately 50 miles west of Calgary near the southeast boundary of Banff National Park. Steve will be your personal ice climbing guide and bring you to all of the best climbing areas. To top it off, Black Diamond Equipment is ready to outfit you with all of your ice climbing needs. You will receive two ice tools, crampons, and gloves. A remarkable image of Kit and Rob DesLauriers at 29,000 feet approaching the summit of Mt. Everest. This was the last of Kit’s Seven Summit descents to make her the first person to climb and ski from the summit of the highest point on each of the seven continents. Photograph is 16” x 24”, matted and autographed by Jimmy Chin and Kit DesLauriers. Includes gift certificate for custom framing. Enjoy a six-night adventure in the foothills of the North Cascades in Tom Vogl's, Mountaineers CEO, deluxe cabin. Located in the heart of Mazama, this is the ultimate package for your outdoor adventure. You'll have access to premier mountain biking, cross country skiing, and backcountry skiing with rentals - from the Goat's beard in Mazama. You will also get to experience the North Cascades from up high! North Cascades Mountain Guides will take you and a partner out for a day of climbing on the Mazama rock. After you're done working up a sweat you can hit the town with dinner at a local favorite, Old Schoolhouse Brewery in Winthrop. Don't forget to stop by Lost River winery for a VIP wine tasting. Today, as we look toward our second century of exploration, The Mountaineers is seeking to once again change the face of the outdoors. We launched youth programs just six years ago, and since have given thousands of young people new outdoor memories, many of whom would not otherwise have the opportunity to explore the outdoors. We've shared backcountry impact skills with the world and created opportunities for members to give thousands of hours to care for trails, lookouts, beaches, and crags. And we've embarked on e-learning initiatives to make the outdoors more accessible to everyone. 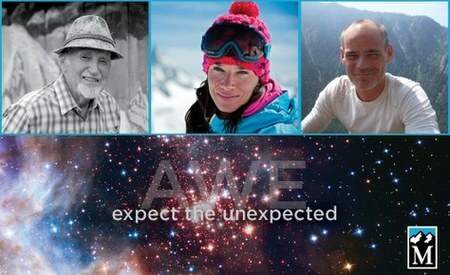 By attending AWE: expect the unexpected, you are helping make all of this possible. 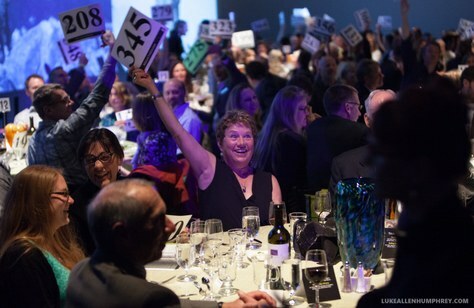 All of the auction items sold at the event will support our abilities to advance our conservation, youth, leadership development efforts. Thank you! Not able to make the event? You can still support these efforts by making a donation today. Thanks to all of our sponsors and in-kind donors!